Meanwhile, season steak pieces on both sides with onion powder, salt and pepper. In 3 separate shallow bowls, place 1/2 cup Bisquick mix, the buttermilk and bread crumbs. Coat steak pieces on both sides with Bisquick mix, then dip in buttermilk and coat with bread crumbs. In 12-inch nonstick skillet, heat oil over medium-high heat. Add steaks; cook 6 to 8 minutes, turning once, until thoroughly cooked. Remove from skillet to plate; cover with foil to keep warm. In same skillet, cook onion over medium heat 5 to 7 minutes, stirring occasionally, until tender. In small bowl, stir together 2 tablespoons Bisquick mix and the milk until blended. Pour into skillet with onion. Cook 2 to 3 minutes, stirring frequently, until gravy is thickened. Split warm biscuits in half. On each biscuit bottom, place 1 chicken fried steak. Spoon gravy over steaks; cover with biscuit tops. If gravy seems too thick, add extra milk. If it’s too thin, stir in an additional tablespoon of Bisquick mix. Chopped fresh thyme or parsley is a nice addition to the gravy. 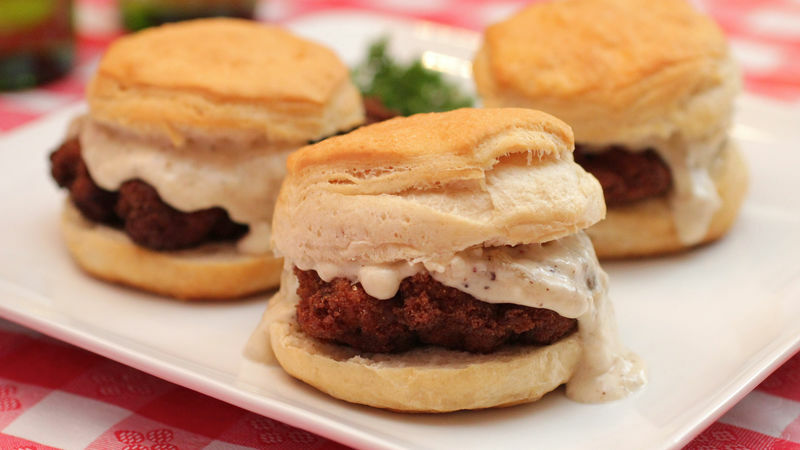 Biscuits, steaks and gravy can be made ahead of time, stored in the refrigerator, then reheated just before assembling.